Hyderabad, Jan 23: Popular actor and Jana Sena Party chief Pawan Kalyan on Tuesday called for respecting cultures and languages of all regions, saying this is a must to keep the nation united. On the second day of his maiden political march in Telangana, he addressed the party workers in Karimnagar town. He said if the sentiments of a region were not respected, it might result in public anger which in turn endangered national integration. Stating that Andhra Pradesh and Telangana were no different, the actor-politician said that in both the states his party would do responsible politics. "Andhra and Telangana are not different. I am ready to give my blood for Telangana," he said. 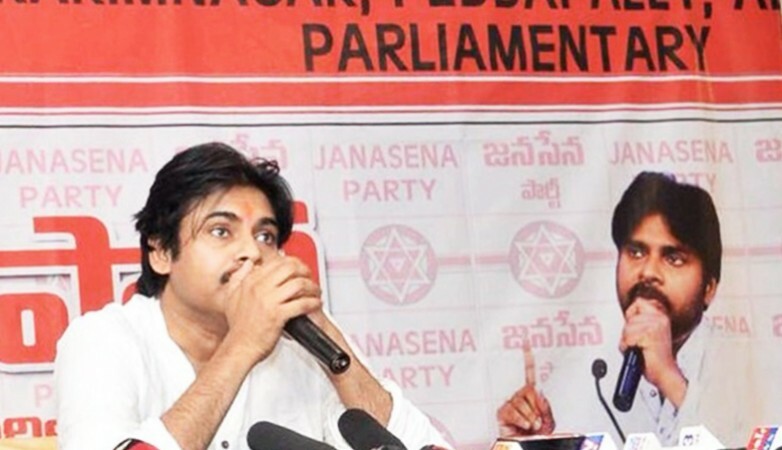 Reiterating that he will not criticise other parties just for the sake of criticism, he said the Jana Sena would study the people's problems and try to resolve them by bringing them to the notice of the respective governments. "If the problems remain unresolved, then we will come out on the streets but that will be the last resort," the actor said amid thunderous applause from his fans. Pawan said if Andhra Pradesh had given birth to him, Telangana had given him a new life. "That is the reason I am launching my political journey from here," he said. At Kondagattu in Jagtiyal district, Pawan on Monday launched the 'praja yatra' after worshiping at a local temple. It was in this town that he had a narrow escape when a high-tension wire fell on him during campaigning in the 2009 elections. He was then campaigning for Praja Rajyam, the party floated by his elder brother Chiranjeevi. Pawan said he always respected the culture and traditions of Telangana in his films. Defending his praise for Telangana Chief Minister K. Chandrasekhar Rao, the actor said Rao played a key role in the formation of separate Telangana and was also trying to solve people's problems. He said he would differ with Rao when required. Pawan urged the youth to work to root out corruption. Earlier, a large number of fans gathered outside the hotel where the actor stayed for the night. Police and his private security personnel had a tough time in controlling the crowd. The Jana Sena chief will continue his 'yatra' in Telangana on Wednesday. He plans to launch the 'yatra' in Andhra Pradesh on January 27. He has announced his party will contest the 2019 elections in both the Telugu states. Pitt, Aniston to rekindle relationship? Naya Face is a unique South Asian community portal combining e- commerce, events, videos, photos and articles. Naya Face is also the 1st community portal connecting all South Asians in North America (US, Canada and the Caribbean islands) and worldwide.